The Hot Dog Truck: Shoemoney or Bootmoney? If you haven't been living under a rock for the past week or so, you will know I entered Shoemoney's Crazy Affiliate Summit West Contest. I didn't win, but I did pretty good considering. I did win a Gold Pass from John Chow, so I am still going! Make sure you check the Hot Dog Truck for scenes from Las Vegas- I leave Saturday if the weather will let me. 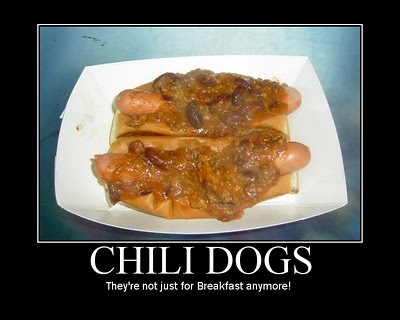 I also plan on doing a Hot Dog Story or two. As an intro to my Vegas adventures, I took a picture of a pair of MY shoes. 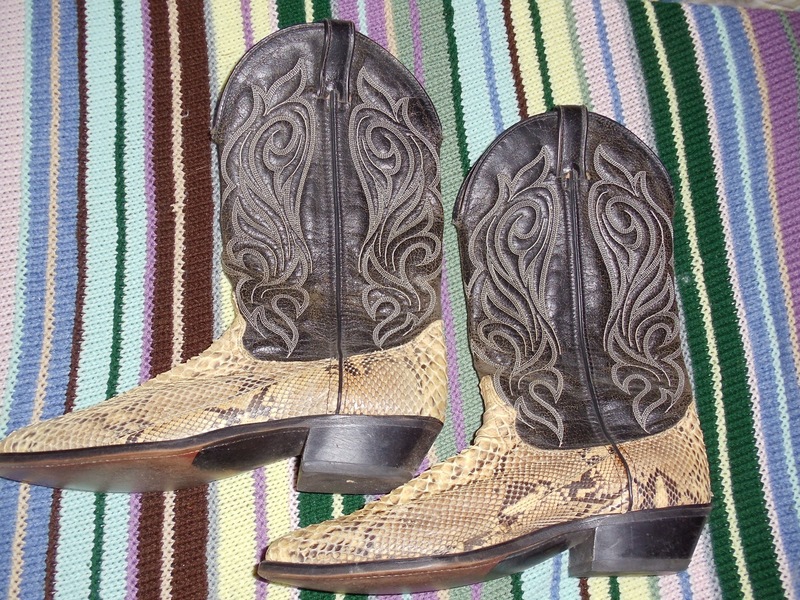 These bad Larries are a pair of snakeskin cowboy boots that I bought in Vegas in 1991. I had a torrid session at the blackjack tables at Harrah's (called the Showboat Casino at the time I believe) and had literally thousands of dollars to burn. While I managed to sock away a few grand to take home, I decided that I would spend some "found money" on something I always wanted-these boots. They set me back about $500 and I very rarely wear them, so they're still "like new." 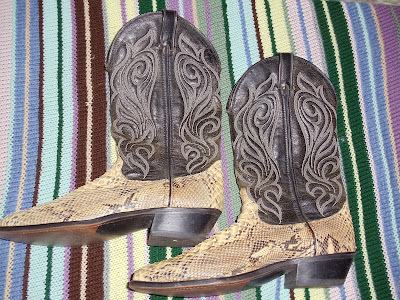 My wife said to me that had she known I owned a pair of these boots when we met, she never would have married me. As a Canadian who spent her junior high school years in Texas, she has some "issues" with this kind of boot. I sure am glad I never wore them on a date with her. So you see, while Shoemoney was still a lad, the Hotdogman was making BOOTMONEY! I won't be wearing these to Vegas this time. They aren't too comfortable to walk in and I figure on doing a lot of walking. My Merrils will be the footwear of choice. Sorry you didn't win the contest, but hey I found your site from shoemoneys post, so it's not a total loss. Bet you picked up allot of readers in the meantime. You need to at least do the boots for an event!